Permanently Repairs: EPDM, TPO, Metal, Fiberglass, Aged & Rigid PVC, Vinyl, Wood, OSB and most building materials. Quick Roof Extreme w/Steel-Loc Adhesive. Permanently Repairs: EPDM, TPO, Metal, Fiberglass, Aged & Rigid PVC, Vinyl, Wood, OSB and most building materials. Can be applied to most materials when damp or even wet! 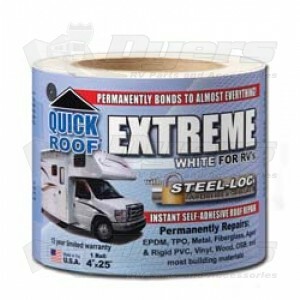 Quick roof extreme is guaranteed not to crack, harden, or shrink. It instantly stops leaks and permanently repairs: all RV roof Materials, vents, skylights, slide-outs, windows, awnings, holding tanks, tents and more!